BEIRUT - A suicide bomber blew himself up in a southern Beirut neighborhood this morning, the latest in a string of attacks that appeared to be directed against the Lebanese militant group Hezbollah which largely controls the neighborhood where the blast was detonated. At least four people were killed and almost 50 were wounded in the attack, according to Lebanon's National News Agency. 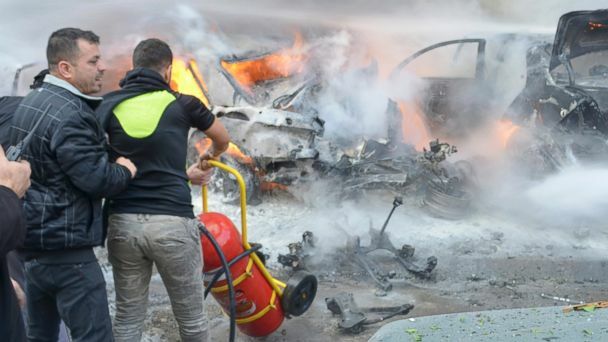 Lebanon has seen repeated spillover violence from the three-year war in neighboring Syria, but with four bombings in the past month, fears have grown that Lebanon is entering a darker, bloodier period. "I think it is the beginning," Dahieh resident Abu Hassan told ABC News amid the crowd of hundreds who had gathered around the blast site, steps from his apartment. "My children, I am keeping at home. I can't send them anymore. It's too dangerous." Responsibility for today's attack was quickly claimed on Twitter by a group called Jabhat al-Nusra in Lebanon. The group bearing the same name in Syria is linked to al Qaeda and is one of the strongest rebel groups fighting the forces of President Bashar al-Assad. Hezbollah is fighting alongside Assad's troops. A statement posted on Twitter said the attack was carried out to avenge Hezbollah's "massacres" of children and civilians in Syria. The war in Syria and Hezbollah's involvement in it has deepened sectarian divisions between Sunni and Shiite Muslims in Lebanon. The vast majority of the rebels fighting in Syria are Sunnis, while the Assad regime is predominantly Alawite, an offshoot of Shiism. Today's bombing was the second in the Haret Hreik district of the mostly Shia Dahieh neighborhood this month. Another car bombing was claimed by Sunni Jabhat al-Nusra last week in the northern, Shia town of Hermel. On Dec. 27, a car bomb in downtown Beirut targeted Mohammed Chattah, a former minister and vocal critic of the Syrian regime and Hezbollah. It was the first bombing in the center of the Lebanese capital since Prime Minister Rafik Hariri was assassinated almost nine years ago. Today's death toll could have been higher. An undetonated explosives belt was found by the Lebanese soldiers who secured the area, the army said in a statement. The explosion had resulted from the three mortar rounds rigged to the attacker's car, weighing over 30 pounds each. "We saw a car that was speeding. The driver was honking like a mad man," the owner of a corner shop across from where the attack happened told Lebanon's Daily Star newspaper. "Seconds later, we saw the explosion which sent the vehicle flying up in the air," he added. The bomber had stopped at the base of an apartment building before detonating his explosives. The building's facade was charred, its windows and balconies shattered, littering the street with debris. A low-slung building across the street suffered similar damage. "Hopeless," replied resident Abu Hassan when asked how he felt about the neighborhood's repeated attacks. "We don't see the end of this conflict."